What Is a Company Looking for in a Second Interview for an Administrative Assistant? 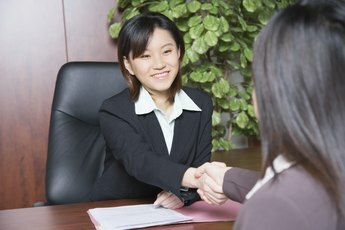 Administrative Assistants must have the merit to survive a second interview. A second interview is a strong indicator of interest. You've passed preselection and more than likely had your first interview with a hiring manager in human resources or a mid-level department manager. Now the company wants to see how you fare with upper management. As an administrative assistant, you are the face of your boss and quite possibly the company. Upper management wants to see what is so remarkable about you that you made it through the first cut and are one step closer to representing them. This makes for a lot of pressure in a second interview. Plan and prepare so you can live up to the hype in round two. A second interview proves that you made the first cut in the hiring process, but the job is not guaranteed. Avoid the cockiness that can come with a callback. You still have competition, and humility goes a long way. 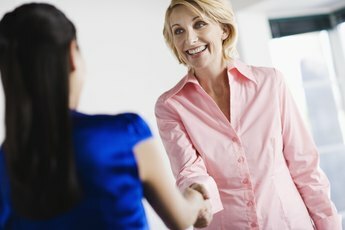 Managers do not want a cocky administrative assistant because you interact with so many people, and they refuse to risk alienation of potential clients and customers because of an admin's bad attitude. You were referred based on your skills and pleasant demeanor in the first interview. Upper management will look for that same behavior in a second interview. Avoiding cockiness doesn't mean giving up your confidence. Upper management understands that a second interview brings with it a higher level of pressure. Executives want to see if you're going to buckle. A manager is only as strong as her administrative assistant and she will take your confidence -- or lack of it -- extremely seriously. Be confident. You beat out many other candidates to get this far. Showing your professional strength is expected and welcomed. Just remember to keep yourself grounded. The time between the first and second interview will allow you to extensively research the company. Upper management will expect you to have questions about your position that are more in-depth than from the first interview. They will also expect to hear how you feel your skills as an administrative assistant mesh with the job requirements for the position. The role of administrative assistant in a company is heavily detailed and you must reassure upper management that you are well-rounded enough to do the job. A second interview means the applicant pool has narrowed from many to few. Basic skills have already been established. Upper management wants to know how advanced your skill set is compared to your tough competition. For example, all final candidates might be skilled with accounts receivable, but being qualified enough to develop accounting methods to better track accounts receivable is another matter. Tell the hiring managers why you are the better candidate. Display your desire for leadership roles. Managers need administrative assistants who can make reasonable administrative decisions in their absence.